Our mission statement is an important guide for the direction of our department. 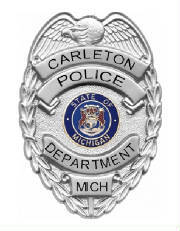 The Department will provide a safe, secure, and welcome environment for the Village of Carleton, its citizens, visitors, and guests through efficient, cost effective, professional, community based police services, and will provide an ethical, people-oriented work environment. We will identify and solve problems through partnerships of police citizen interaction. Our emphasis is on integrity, fairness, and professionalism where our members may enjoy their jobs, utilize their talents, respect one another, and grow as individuals.